“Why lovely friend indulge that tear! 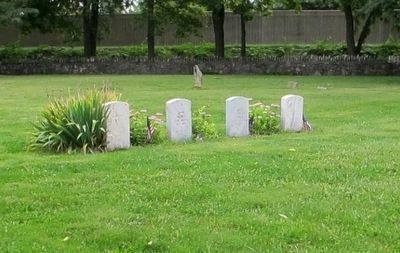 It is this place that the founders of Franklinton, the first settlement in Columbus, found worthy to lay their loved ones for the rest of eternity. 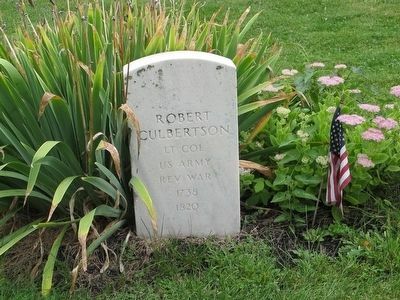 Cemeteries contain many hidden clues about the past, written in headstones, architectural features, and long since forgotten burials, paths, and building foundations. Archaeologists use geophysical survey instruments, which can detect things below ground without digging, to uncover some of the forgotten past. 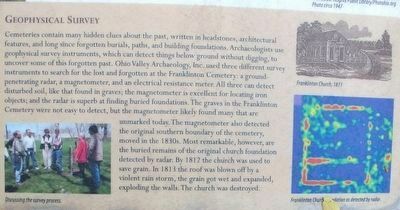 Ohio Valley Archaeology, Inc. used three different survey instruments to search for the lost and forgotten at the Franklinton Cemetery: a ground penetrating radar, a magnetometer, and an electrical resistance meter. All three can detect disturbed soil, like that found in graves; the magnetometer is excellent for locating iron objects; and the radar is superb at finding buried foundations. close up, upper right portion. Prose and poetry. 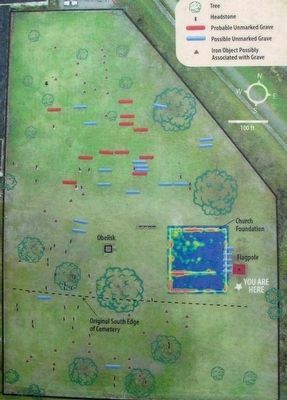 The graves in the Franklinton Cemetery were not easy to detect, but the magnetometer likely found many that are unmarked today. The magnetometer also detected the original southern boundary of the cemetery, moved in the 1830’s. Most remarkable, however, are the buried remains of the original church foundation detected by radar. By 1812 the church was used to save grain. In 1813 the roof was blown off by a violent rain storm, the grain got wet and expanded, exploding the walls. The church was destroyed. The Columbus Foundation Exhibit developed with support from the Joseph A. Jeffrey Endowment Fund of the Columbus Foundation. Erected by Joseph A. Jeffrey Endowment Fund of the Columbus Foundation. Location. 39° 57.766′ N, 83° 1.305′ W. Marker is in Columbus, Ohio, in Franklin County. Marker can be reached from the intersection of River Street and North Davis Avenue, on the left when traveling east. Touch for map. 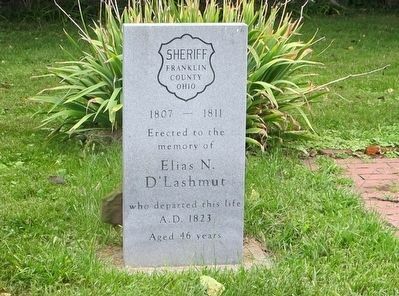 Marker located in the Old Franklinton Cemetery. Marker is at or near this postal address: 750 River St, Columbus OH 43222, United States of America. Touch for directions. (approx. ¼ mile away); Franklinton (approx. 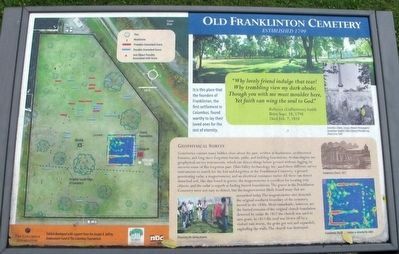 0.3 miles away); a different marker also named Franklinton (approx. 0.3 miles away); a different marker also named Franklinton (approx. 0.4 miles away); Council Site Between William Henry Harrison and Indians (approx. 0.4 miles away); Maurice Gates (approx. half a mile away). Touch for a list and map of all markers in Columbus. 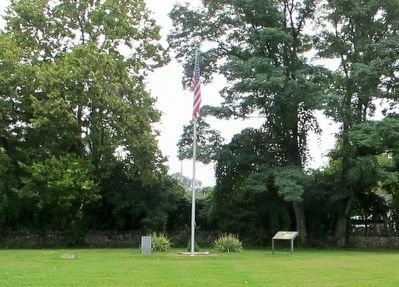 three Revolutionary War markers, one Civil War marker, all "under the flag"
Note the name on this marker, compare to the prose on the main plaque. More. 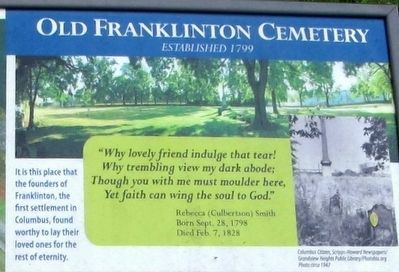 Search the internet for Old Franklinton Cemetery Archaeology. Credits. This page was last revised on June 16, 2016. This page originally submitted on September 7, 2015, by Rev. Ronald Irick of West Liberty, Ohio. This page has been viewed 194 times since then and 5 times this year. Photos: 1, 2, 3, 4, 5, 6, 7, 8. submitted on September 7, 2015, by Rev. Ronald Irick of West Liberty, Ohio. • Bernard Fisher was the editor who published this page.